Or the beginning of my experience anyway. Last Friday I went to see any energy healer. Not somewhere I would have ever envisioned myself ending up. But when you have constantly evolving physical and mental ailments, and you refuse to take pharmaceuticals, sometimes you end up on the path less traveled. Plus I kind of gave up about a month and a half a ago. I was being such a good girl (no stress, eating like a champ, taking my supplements, sleeping, meditating, practicing daily yoga, dry brushing, steaming, ya-da, ya-da, ya-da - a ridiculous amount of self-care) and nothing was working. I was steadily feeling worse and worse. Even my 4-year old shoulder injury decided to flare up for no apparent reason (like, really flare up). I felt very broken and defeated. I had felt low before. But this was almost harder because I have no reason to be low. I really don't have any stress. My life is really amazing. I want to enjoy it. But there is clearly some major imbalance in my body and my old bag of tricks was not helping. So I begged God to take over. For probably the first time in my life I said "That's it, I'm done. You take over". Might not seem like a big deal to you but it was a big deal to me. I'm a control freak and I really surrendered. And of course things started to happen. Within a couple weeks I had a business card in my hand and someone strongly urging me to book an appointment with an energy healer. A nice Christian gal she said. She'll fix you she said. So off I went. Tramping down any skepticism I had as best I could. I showed up with an open mind, just dying to know which one of my Chakra's was blocked. I go on Pinterest regularly and study the Chakra charts. I can never figure out which one it is? Well, there's a reason for that - you'll find out if you can bear with me. We go into a room set up for massage therapy and, of course, I immediately blurt out "I'm nervous". I always think clairvoyant people are going to see nasty things inside me that I don't want to know about. She assured me I wouldn't levitate or anything (I was relieved and mildly disappointed). 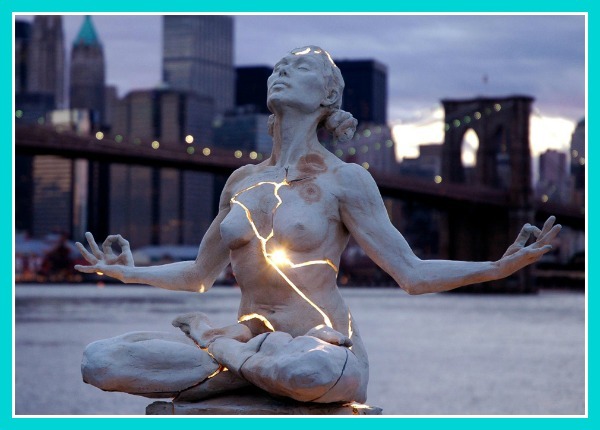 She gave me her "story" and why she believes in energy medicine. Turns out she is much more scientific about the whole thing than spiritual. Or at least that's how she came across. If you are curious she follows the Eden Energy methodology. I told her my story which included many tears. It makes a person feel so vulnerable to admit all your weaknesses out loud to a complete stranger. I actually felt like crying as soon as I walked in the room. Not sure what that was all about. Anyway, she started out by "testing" my energies/meridians and gave me exercises for each one. Don't ask me what exactly she did but it involved me trying to counterbalance as she pushed my extended right arm downwards. If the corresponding meridian was strong, I could easily counterbalance her light pressure. If I was not strong, my arm would basically give out. That happened A LOT. I'm not talking physical strength (I do work out almost every day - toot toot), its energetic strength. Which apparently I don't have. Interestingly, I was "stronger" when moving backwards instead of forwards. Then she asked me to read a sentence left to right. I read normally. Then right to left (backwards). Its just spewed out of my mouth. I was actually pretty shocked I could read backwards like I was on speed. But, you guessed it, that is not good. She gets me to do some of her energy exercises and she tries it again. This time I read backwards like a normal person. And she continues to retest each meridian after I have done the corresponding exercise. I pass. Yeah. She then got me to look at a picture with an X on it. She did her arm test - I failed. Then she showed a picture of two parallel lines. It so appealed to me, I love order. I passed. Happy dance. Nope. That means my energy is just flowing in parallel lines which is not good. It's supposed to cross back and forth through the body. Shucks. I left with a list of these exercises that I do three times a day. Takes about 8 minutes each time. I've had to do them in somewhat public places and I know I look like some new-age hippy but you gotta do what you gotta do. There are all sorts of videos on YouTube - look up Donna Eden Energy Routines if you want to try and DIY it. Next I got to lay on the table. She did some work with magnets, which she said worked really well on me? Okay. Sure. Then she did a whole bunch of, I guess, Reiki-type stuff. I kept my eyes closed almost the whole time and tried to focus on my breathing so I don't know exactly what was going on. I think lots of waving her arms over my body (not touching) in swirly patterns. She also used a cold laser over certain organs, shone a light on my shoulder and physically laid her hands on me a few times. I didn't feel any pain or unusual sensations (I was secretly hoping for something dramatic to happen so I would be miraculously CURED). But I did notice that my FEET were freezing even with a heater on in the room, a blanket and the massage table heater cranked. And I could feel awareness/ vibrations/life/energy in the left side of my body but not the right. I tried really hard to focus my mental energy on my problem shoulder but it was like a dead zone. Which is likely the problem. This whole process took two and a half hours. I was supposed to be there for a maximum hour and a half. But I'm special. I require special attention. So what was my prognosis?????? They are all blocked. I am a big blocked mess. Apparently my energies are completely scrambled. Not flowing. All my Chakra's blocked. I'm not ROOTED at all. I have polarity. At one point she was testing my Chakra's, don't ask me how, and she just said "Yep, blocked. Yep, blocked. Yep, Yep, Yep, Yep, Yep...........how are you even walking around? This seems to be a theme. In the past two months, every health professional that has "laid hands on me" has basically told me the same thing. Like I said, she was more scientific about things than spiritual. She didn't tell me what possible physical or mental trauma in my life may have caused the energy state I'm in. I have some ideas that I'm trying to explore on my own - I don't believe its one thing but a combination of a lifetime of digestive ailments, prolonged periods of stress during my childhood and again later in adulthood, some poor lifestyle choices and my personality. But she says she can fix me. Actually, that she can teach me how to fix myself. She's really into the teaching thing so you can become self-sufficient. I like that. She also said my aura is yellow but very tight to my body. This supposedly stems from fear (hmmmm, its not like I have anxiety - lol) and explains why I'm always so cold. And it had a Hole in it. Which apparently she also fixed, but she's not sure if it will hold. No worries, I'll be going back for round two this Friday so we'll see. As soon as I left I felt SO TIRED. Like I could barely hold up my head. I actually had to go lay down for a nap which I never do. To be honest I felt like I could just sleep for the rest of the day but I forced myself to get up and moving (after an hour). I was also uncharacteristically thirsty for the rest of the day. So that's my experience. My grand adventure into energy healing. Now its still early days so I don't want to make any conclusions. I'm just trying to trust in the process and go with the flow. But speaking of flow, I have sailed through what is usually a week from hell with barely a twinge of moodiness or insomnia. And when I meditated this morning I could actually feel some sparks of life on my right side - not much but a bit. My shoulder feels better this week than it has for the past six. Something is shifting. I am feeling SO MUCH BETTER. Life is starting to look pretty rosy again. Can't say if its the energy work, all the herbs I'm taking, the Candida diet or all the mental and spiritual self-work I have been doing but things are moving in the right direction. And it feels good. Thank-you God! Oh my goodness. I can relate in soooo many ways. Haven’t tried the energy healing, but maybe that needs to be on my radar. Did all of these issues happen after you had a child? I always had some digestive issues, but 18 months after my child, I had pain in my body, major digestive problems, dealing with Candida now, and other undiagnosed ailments. I’m just a bag of problems right now. Ugh!!!! Happy Thanksgiving - An Exercise in Gratitude!